Sir Leslie holds a unique place in our literary and cultural history as a distinguished man of letters, and especially as the first editor of the Dictionary of National Biography and the author of as many as 378 of its original biographies (see Lee). He is well known too because he features in the work and biographies of his even more famous novelist daughter, Virginia Woolf, particularly as the inspiration for Mr Ramsay in her novel, To the Lighthouse. His first wife was Thackeray's younger daughter Harriet, and he was a close friend of many of the literati of his day. These included the novelist and poet George Meredith, who paid warm tribute to Stephen by sketching him in the energetic, reflective and thoroughly likeable Vernon Whitford of The Egoist (1879; see Meredith 331). Another close friend was James Russell Lowell, whom he met on his first visit to America in 1863. In early manhood Stephen was a keen mountaineer — his book about his experiences in the Alps, The Playground of Europe (1871), is a classic of its kind. After loss of faith compelled him to resign his fellowship at Trinity Hall Cambridge and renounce Anglican orders, he pursued a career in literary journalism and editorship. Most notably, he was editor of the Cornhill Magazine from 1871-82, and from then on devoted himself to the massive work of the DNB. 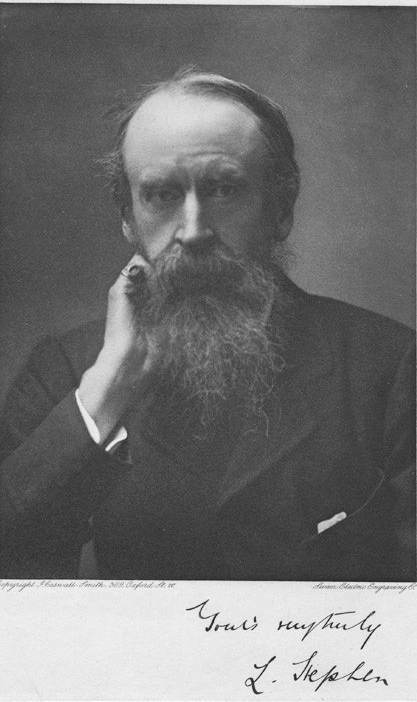 But he also produced many books besides his mountaineering one, starting with the early Sketches from Cambridge, by a Don (1865), and including Essays on Free-thinking and Plain-speaking (1873), History of English Thought in the Eighteenth Century (1876), The Science of Ethics (1882), An Agnostic's Apology (1893), Social Rights and Duties (1896), and several literary monographs. He was a prolific literary journalist and contributed to many other books as well. Reserved by nature, Stephen was nevertheless one of the earliest members and presidents of the Alpine Club, members of which attended his cremation service at Golder's Green. He continued to be a great walker, and was the leading light of the less challenging "Sunday Tramps," who took long hikes through the countryside around London, dining at Meredith's home in Surrey before returning to London in the late evening. The members of this group, numbering as many as sixty over the sixteen years of its existence, were all "men of distinction in science or Literature" (see Bell; Meredith 331). Annan, Noel G. Leslie Stephen: The Godless Victorian. Rev. ed. of a 1951 account. London: Weidenfeld and Nicolson, 1984. Bell, Alan. "Stephen, Sir Leslie (1832–1904)." Dictionary of National Biography. Online ed. Web. 1 October 2014. Bicknell, John W. Selected Letters of Leslie Stephen, 1882-1904. Columbus: Ohio State University Press, 1996. Braham, Trevor. When the Alps Cast Their Spell: Mountaineers of the Alpine Golden Age. Glasgow: Neil Wilson Publishing, 2013. "Death of Sir Leslie Stephen." Times. 23 February 1904: 10. The Times Digital Archive. Web. 1 October 2014. Fenwick, Gillian. Leslie Stephen's Life in Letters: A Bibliogrphical Study. Aldershot: Scolar Press, 1993. Hansen, Peter H. The Summits of Modern Man. Cambrige, Mass. : Harvard University Press, 2013. Lee, Sidney. "Stephen, Sir Leslie (1832–1904)." Dictionary of National Biography (1912). Archive linked to the online ed. Web. 1 October 2014. Maitland, F. W. The Life and Letters of Leslie Stephen. London: Duckworth, 1906. Internet Archive. Contributed by the University of Michigan. Web. 1 October 2014. Meredith, George. Letters, Vol. 2. New York: Scribner's, 1913. Internet Archive. Web. 29 September 2014. Ring, Jim. How the English Made the Alps. London: John Murray, 2000. Siskin, Alex. "Peaks and Valleys: Leslie Stephen, Mountaineer." Paris Review Daily. 26 November 2012. Web. 1 October 2014. Stephen, Leslie. The Playground of Europe. London: Longman, Green & Co., 1871. Woolf, Virginia. To the Lighthouse. Oxford: Oxford University Press (Oxford World Classics), 1992.